Modern house plans do not attempt to recreate styles of the past. With innovative contemporary design elements, modern homes tend to focus on the relationship between the exterior and interior. 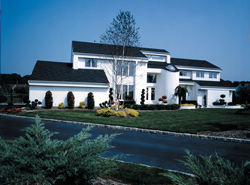 Ranging from almost any type of floor plan, Modern style homess are not bound to specific rules. From ranches to two-stories, these homes typically feature large, open floor plans with expansive windows and high ceilings, and they always lack ornamentation. Our collection of modern house plans are designed to fit many lot sizes, whether narrow, sloping or waterfront, and blend different design elements inside and out. The Juno Modern Home has 3 bedrooms, 2 full baths and 1 half bath. 2190 Sq. Ft., Width 40'-0", Depth 75'-0"
The Sunny Top Craftsman Home has 3 bedrooms, 2 full baths and 1 half bath. 2498 Sq. Ft., Width 63'-0", Depth 91'-0"
The Radko Prairie Style Home has 1 bedroom and 1 full bath. 600 Sq. Ft., Width 20'-0", Depth 30'-0"
The Rockport Modern Home has 1 bedroom and 1 full bath. 899 Sq. Ft., Width 34'-0", Depth 30'-0"
The Tate Modern Home has 2 bedrooms and 1 full bath. 780 Sq. Ft., Width 26'-0", Depth 44'-0"
The Cato Contemporary Home has 4 bedrooms, 2 full baths and 1 half bath. 2241 Sq. Ft., Width 76'-0", Depth 60'-3"
Discover modern home designs featuring unique Contemporary floor plans that will make your new home stand out in any neighborhood. See hundreds of gorgeous modern and sleek plan designs ideal for many different locations.